If someone told me that one day I'd keep company with Dave Eggers, Nick Hornby, Frank McCourt, Elizabeth Gilbert, Tobias Wolff and Sarah Vowell in a book, I would've told them they were crazy. But not anymore... I'm in this book! It must be some kind of mistake. No, in all seriousness, I was interviewed for this book a while ago and was thrilled to participate. It was put together by Jennifer Traig, author of Devil in the Details and Well Enough Alone, for 826 Valencia, a non-profit organization founded by Dave Eggers dedicated to supporting kids 6-18 with their writing skills. At last—the contemporary masters of memoir have come together to reveal their strategies and impart their advice. This book contains an unprecedented wealth of knowledge in one place. 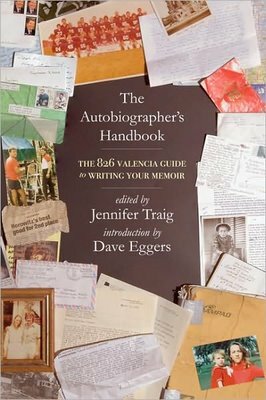 In The Autobiographers Handbook, you’re invited to a roundtable discussion with today’s most successful memoirists. Let Nick Hornby show you how the banal can be brilliant. Elizabeth Gilbert will teach you to turn pain into prose. Want to beat procrastination? Steve Almond has the answer. Learn about memory triggers (Ishmael Beah: music) and warm-up exercises (Jonathan Ames: internet backgammon). These writers may not always agree (on research: Tobias Wolff, yes, Frank McCourt, no) but whether you’re a blossoming writer or a veteran wordsmith, this book will help anyone who has ever dreamed of putting their story on paper, on writing themselves into existence. All proceeds from this book will benefit the 826 centers across America so buy one today! It would make a great gift for that budding memoirist you know... or just for yourself!